Today’s NSCDA-CT members are following in the footsteps of all the Colonial Dames who came before them. They are providing the vision, leadership and resources necessary both to care for the houses and plan and prepare for the future. Major efforts are underway to construct a new Visitor’s and Education addition behind the Webb House woodshed that will provide the exhibition and education spaces that are currently lacking, but are essential for the Museum to care for and display its collections, especially items collected and donated by NSCDA-CT members, and to offer new public programs. 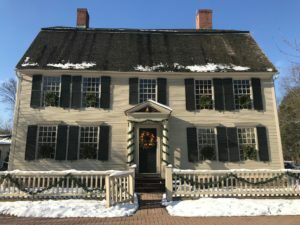 Between 1915 and 1935, The Connecticut Society’s Committee on Old Houses documented over 1000 of the surviving 17th, 19th and 19th century houses in the state. The professional survey form required a title search, measurements, materials and floor plans. The Committee commissioned architect J. Frederick Kelly to prepare many of the architectural plans and elevations for the Society’s publications. Mr. Kelly later used the drawings in his own book, Domestic Architecture of Connecticut, published in 1927 and still an important reference on 18th century houses in Connecticut. Many of the documented houses had been built to serve as inns along the post roads that linked the towns, cities and states of the new nation. The 1,017 volumes, bound in blue Moroccan leather, reside in the Connecticut State Library. Patriotic Service is an important dimension of the NSCDA’s work. The National Society offers a number of programs in which individual societies may choose to participate. Here in Connecticut, we offer prizes for academic work at the graduate school, college, and high school honors levels. In 2016 we awarded a prize to the author of a Senior Honors Thesis concerning witchcraft in New England before the Salem trials. In addition, we participate with other state societies in the Washington Workshop program. This program is held for one week each year in Washington DC for high school honors students who participate in a series of events designed to teach them about how the US government works, key issues and problems. The program includes day trips to important Washington DC sites, evening discussion groups, and meetings with legislators on Capitol Hill. Some former students tell us that this program inspired them to change career goals and become involved in government. We are also working on some possible initiatives in the area of outreach to immigrants and refugees to assist them in establishing themselves in the U.S. as productive and active citizens contributing to our country. These initiatives are still under discussion and consideration.